I read a lot, I look at a lot of charts and I listen to a lot of client concerns during regular reviews. If I close my eyes and find that quiet place, I sense confusion in the system right now. Outside of the White House, there isn’t really much confusion if one assesses some simple truths leading us to some clear strategic choices with our money. Let me preempt this update with a quick bit of financial education. Tactical moves are those that you might make on a shorter time frame. By shorter, we’re talking about months, not days. Here we can find sector rotation moves, intermediate term market trends, identify times to cut some exposure and other times to add back exposure. Tactical can be a date with an investment, rather than a marriage. You’ve heard me talking in April about adding back market exposure with “rental” positions in free to trade indexes. I know that I won’t own them for long but when we see a low risk entry point in a toppy market, “rentals” are a good option. Strategy is conversely a longer-term play. Here we look at asset class performance over longer time periods, we focus on valuation differences across countries, we might factor in long term plays like the death of brick and mortar retail, the aging of American demographics or the evolution of how we use energy. These are strategic considerations that can and should dominate our core commitments over longer periods of time. For this update, let’s focus on the clear and unequivocal strategic realities in an effort to reduce confusion and help us put our money in the right place. This is not up for debate. It is what it is. Sovereign debt like Treasury bonds, are down nearly 15%, shorter term bonds are approaching double digit losses from the highs, corporate bonds are down but have not yet reflected rising underlying defaults (see Toys R Us bonds), etc. It’s worse outside the US. As a matter of practice, Investors should not have their money in asset classes that are in bear markets. Right? Warning – do not touch. Today, we own only Floating rate funds which are still annualizing close to 5% and a sprinkling of tax free municipal bonds which continue to trend higher as investors realize that the tax reform act is a zero sum benefit to individuals. That’s it. Our bond allocations are sitting snuggly in cash waiting for a more attractive environment to make some real money. In the meantime, we’re clipping some income coupons, paying for fees and inflation but that’s about it. The good news is that bonds have been unproductive investments for nearly 6 years and they are rebuilding value in the process. I would guess that by early 2019, we’re going to see some very attractive opportunities in all types of bonds and our income strategies will produce some excellent results with a fraction of the stock market risk. Sit tight, we’re in the driver’s seat on this and the story will end well. If one simply observes the slope of the long term moving averages, we see a rising slope for both the 50 and 200 day moving average for almost all indices. The Russell 2000 jut poked out to an all time new high as did several other equity sectors. While the jolt of higher volatility in January and February brought “trend” into question, it has subsequently bounced higher and the uptrend is still intact. Things are even a bit extended to the upside in the short term, so we’re not surprised and actually welcome a bit of a pullback now to keep things in check, hopefully extending these price gains into a healthy summer rally. Strategically, we should still own stocks because they are trending higher. Our “Trend” indicator is our largest weighting in our Net Exposure model operating in a range of -4 to +4 . The current value is a +4. What to buy is another story but I would still consider sticking with “rentals” from here on out. You know that we expect a significant market peak this summer, possibly July and a bear market in 2019. Stocks are the next in line to experience a reset of some variety. The typical pattern is the same. Bonds peak, then stocks, then commodities, in that order with various lead and lag times. So let’s not get passive about anything in our stock portfolios. Selectivity will dominate from here on out so if doing your daily push ups to stay in the right place is too much for you, it’s not wrong to begin cutting back on stock exposure in general. We are still sitting on 15-25% cash. We might get it to work, and we might just sit on it if we don’t find enough reason to deploy. I don’t know the future, but the new uptrend in commodities is clear. I’m going to call it a new bull market at this point. I spoke to this last week. It started with oil, spread to basic materials and is now drawing in strength in metals, mining and other classic hard asset plays. You might remember the rolling 10-year return chart shown last week for commodities, which might quicken your pulse a bit. Commodities have not been this attractive since the early 30’s and we might see a whopper of a move higher for much longer than people think. Along those lines, allocations to commodities inside investor portfolios are also at an all time low. When the flaming eyeball of big money begins to rebuild their commodity positions, there is a leveraging effect in prices for this relatively small segment of the financial markets. 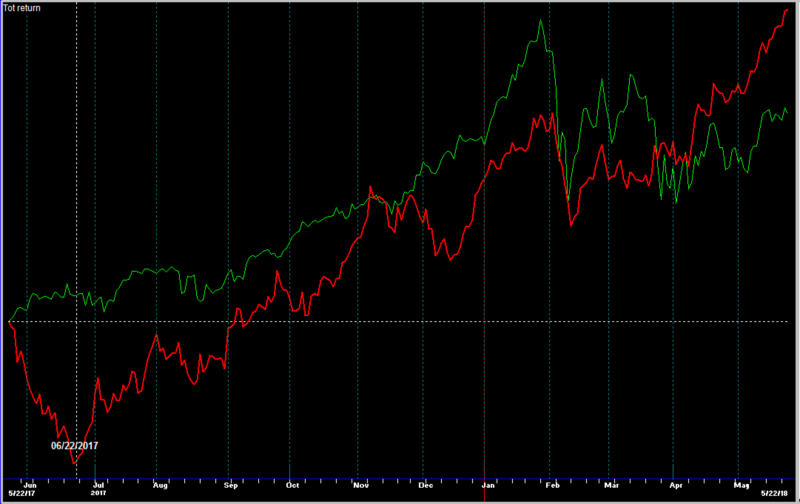 Here’s a one year chart of the very generic commodities index shown in Red versus the S&P 500 shown in Green. Commodities are appreciating at a 3:1 ratio to stocks since last June. Strategically, we should own Commodities and look for opportunities to accumulate exposure (aka buy pullbacks). There are a lot of strategic themes that I find very attractive from a longer perspective if one is willing to tolerate some volatility along the way. That’s it for this update, just trying to clear up some confusion. Get outside and enjoy the spring time!